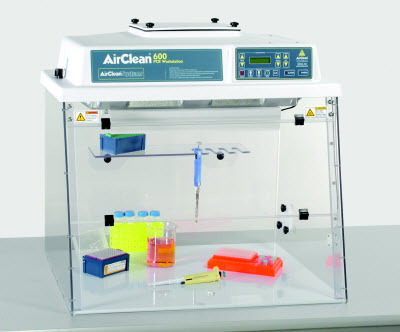 AirClean® Systems AC600 Series PCR workstations are designed as application solutions for the manipulation and amplification of DNA and RNA. These PCR workstations are available in 24’’, 32’’, and 48’’ widths. Additional features include built-in 254 nm ultraviolet lights for irradiation and HEPA filtration for a clean work area. Standard on 32’’ and 48’’ wide models, the UVTect™ Microprocessor Controller maintains airflow to provide a clean Class 100 work area during PCR preparation. UVTect™ provides audible and visible alarms to alert the end user of insufficient airflow, UV bulb changes, and HEPA filter changes. UVTect also allows the operator to vary blower speed and digitally set irradiation timer and lab event timer to current application requirements. The AC600 Series PCR workstations offer innovative seamless UV-reflective Lexan construction with 360-degree visibility. In addition, each workstation features an interlocking sash with a safety switch that automatically turns off the ultraviolet light and activates blower and fluorescent light when the sash is raised. AirClean® Systems AC600 Series PCR workstations are made in the USA and are shipped fully assembled.